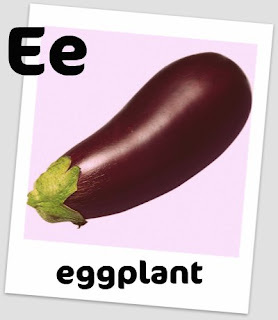 E is for Enzo, my 2 yr old son, and for eggplant. 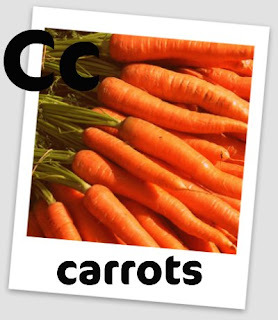 C is for carrots and for Christmas. Enzo is getting some flash cards that I made as a Christmas present this year. The ABC of food. I had so much fun designing these today. Tomorrow I will print and laminate. Go HERE to view all the cards. Feel free to print them for your own kiddies to enjoy. Very clever...hopefully, he won't grow up to be a chicken finger & fries kid with parents like you. If the cards don't get wrinkled, torn or eaten, I could you see you making some sort of kitchen decoration out of them after Enzo has learned his abc's. I think it would like great. This is so neat! These are so beautiful! I bet Enzo will love them! PS. Am absolutely printing and laminating, I love that idea. Merry Christmas to all wet ankled Palmers everywhere! Joan, Enzo loves fries and Chicken fingers. I guess the next creation should be junk food flash cards. I am actually thinking of making some in Portuguese. I mean, seriously, you gotta have some beans in there right?! Thanks for the nice comments. I am glad you all like it. Let me know if your kids enjoy them. Nossa Da que otima ideia!!! O enzo ira aprender tanto !!! Feliz Natal !! !